Pottermore has recently released the last chapters of [amazon_link id=”0439136369″ target=”_blank” ]Harry Potter and the Prisoner of Azkaban[/amazon_link], but who knows when [amazon_link id=”0439139600″ target=”_blank” ]Harry Potter And The Goblet Of Fire[/amazon_link] will be ready to go. I am going to try to remember to think of questions I hope will be answered on Pottermore as I go forward. This reflection will cover chapters 11-15 of Goblet of Fire. Of note: at the beginning of Chapter 11, “Aboard the Hogwarts Express,” Harry expresses feeling “a definite end-of-the-holidays gloom” as he, Hermione, and the Weasleys will be setting off for King’s Cross to board the Hogwarts Express that morning. This is the first time in the series when Harry wishes summer would last longer, and I contend it’s because it’s the first time he’s spent the end of his summer with the Weasleys. On the train, the trio overhears Malfoy talking about how his father wanted to send him to Durmstrang. I suppose it stands to reason that witches and wizards can attend school outside their home region or country, but this the first time we’ve encountered it in the series. Of course, even if it were unusual, Malfoy would not likely have had any trouble, given the connection between his father and Igor Karkaroff. Have you ever noticed how often the bad guys have Russian or Eastern European names in this series? It really started to bother me a bit the more I noticed it because it almost feels like Cold War era distrust of Soviets and communism. In the course of the conversation the trio overhears, we learn two interesting things about Durmstrang: 1) According to Malfoy, they don’t admit Muggle-born students, and 2) Students at Durmstrang learn the Dark Arts. Likely Igor Karkaroff alone is not responsible for both policies. We will later learn that Gellert Grindelwald attended Durmstrang, and he was notorious for his desire to subjugate Muggles “for the greater good.” In typical Rowling fashion, she said during an interview that she “thinks that Durmstrang is in northern Scandinavia—the very north of Sweden or Norway and that Beauxbatons is somewhere near Cannes in the south of France.” Durmstrang has been around since at least 1294 because it competed in the Triwizard Tournament that year. The films made an interesting choice in depicting it as a boys’ school (and Beauxbatons as a girls’ school). I am not a fan of that choice, but it didn’t significantly alter the storyline, so it’s not a huge deal. In chapter 12, “The Triwizard Tournament,” we learn another interesting tidbit about sorting. It stands to reason that families frequently share certain values, such as courage, intelligence, hard work and loyalty, or resourcefulness and ambition. Thus, it is not unusual for families to wind up in the same house. Notable exceptions have occurred. We know, for instance, that Sirius Black is the only Black who wasn’t as Slytherin. The Patil twins are an interesting case, as Parvati is in Gryffindor, and Padma is in Ravenclaw. However, all the Weasleys are in the same house (and the same house as their parents), and Harry was in the same house as his parents. But according to Hermione, it is not necessarily true that family members wind up in the same house, which is interesting for later on when we learn about Sirius’s family. I like it when Rowling plants an interesting fact in her books, but we don’t see it flower until much later. The Sorting Hat sings a different song this time, and one line goes, “I’ve never yet been wrong.” I wonder about that. I don’t understand, for instance, how Peter Pettigrew wound up in Gryffindor. Pottermore explains beautifully how Neville did, and of course, Neville shows his bravery and courage as the series unfolds. Pettigrew just doesn’t. The Sorting Hat does occasionally have a very hard time deciding where to place students. Students who take longer than five minutes to sort are known as Hatstalls. On Pottermore, we learn that Neville and Hermione came closest to being Hatstalls in Harry’s year. BUT! According to Pottermore, “the Sorting Hat is notorious for refusing to admit it has made a mistake in sorting a student.” So, you can’t believe the hat. I really think that passage was written just to explain Peter Pettigrew. Another very cool side note on this chapter. A girl named Natalie McDonald is sorted into Gryffindor. Natalie McDonald was a real fan of the books—a young Canadian girl who passed away from leukemia. A family friend had written to Rowling asking her to write to Natalie and tell her how the series would end. Rowling did, but Natalie didn’t receive the letter before she passed. Natalie’s mother responded, and the two women developed a friendship. If you did not tear up a little when you heard that story, then I just don’t know about you, my friend. Here is a link to an article about it. Towards the end of the chapter, there is yet another mention of Neville’s poor memory. Some fans have speculated he suffered from a poorly-cast memory charm and that he may have seen his parents being tortured. I am not sure if I buy it, but it’s an interesting theory. As evidence, I have seen these fans mention Neville’s upset over seeing the spider undergo the Cruciatus Curse. He also describes the mermish screeching from the Golden Egg as sounding like people being tortured. Later on, when Neville doesn’t sign up for Charms, McGonagall reveals that Augusta Longbottom wasn’t very good at Charms herself, which is why she denigrated it to Neville. If she were the one who cast the memory charm, so the line of thinking goes, perhaps it explains why he seems to suffer in the same way as other characters who have experienced problems with memory charms. At any rate, Rowling mentions it several times, and I wonder if we’ll find out at some point on Pottermore why Neville has such a bad memory. Or maybe there’s no reason. But I am curious. In chapter 13, “Mad-Eye Moody,” we see Moody turn Malfoy into a bouncing ferret. Satisfying as that may have been, it’s pretty appalling behavior for a professor. I wonder if the real Moody would have done it. I have a lot of questions about Barty Crouch, Jr. Note also that Professor McGonagall once again has an armful of books that she drops. Someone ought to count how many times she does that in the series. It’s dangerously close to a motif. In chapter 14, “The Unforgivable Curses,” we learn for the first time exactly how Voldemort killed Harry’s parents. I actually really love this chapter. I am not sure Dumbledore actually does know what Moody is doing in his classes and actually approves, but the end result is that the class learns a lot from him. Even if he is a Death Eater. Also, unusually for a DADA teacher, Moody has communicated with their previous teacher to find out what they have learned. I guess since Quirrell died and Lockhart lost his memory, it would have been impossible for anyone to find out from them what the students had learned, but it is interesting that Moody mentions it. I really hope Pottermore reveals more about the Crouches. I would love to know what house Barty, Jr. was in. I suspect Ravenclaw, but I know others think Slytherin. Not all the bad guys come from that house. Quirrell was a Ravenclaw, and in many ways, Barty, Jr.’s career as a Death Eater seems to follow the same trajectory as Quirrell’s ill-fated entanglement with Voldemort. I also want to know if he really was guilty of torturing the Longbottoms or not. The books leave this open to question. It is rather amazing that despite the fact that DADA is taught by a mentally unstable Death Eater that year, Harry and Co. still learn a lot. Perhaps more than they learned from any other DADA teacher. Even Lupin. In chapter 15, “Beauxbatons and Durmstrang,” the class’s lessons continue as each of the students is put under the Imperius Curse, and Harry alone fights it. 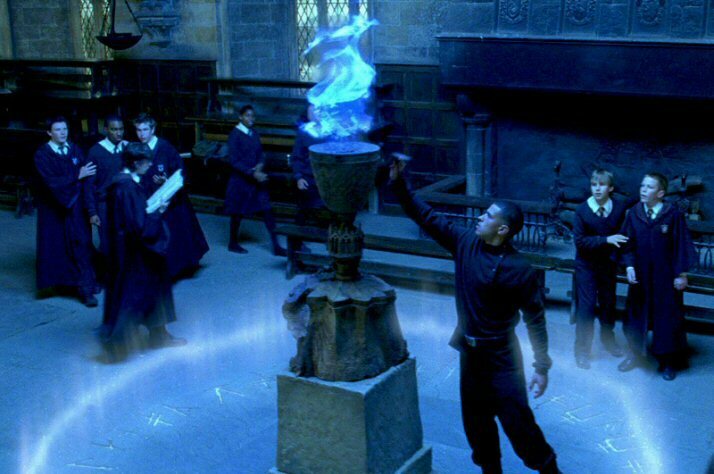 As with casting the Patronus, this ability to fight the Imperius Curse sets Harry apart from his peers in DADA. I still maintain he would have been the best DADA teacher ever had he gone that route with his career. And, in fact, some of his peers comment that he was their best DADA teacher when he teaches the DA how to fight. Another question I have, and I hope Pottermore addresses it, is why Professor Binns was so preoccupied with goblins. True, the history of Gryffindor’s sword is really important in the last book, but I wouldn’t mind knowing more about why goblins are so important to wizarding history. Or at least to Binns. He has them writing essay after essay about Goblin rebellions in this chapter. Of course, by the end of the chapter, the Beauxbatons and Durmstrang delegations have arrived. More about all of that anon. I love that the Sorting Hat won't admit it's wrong! I like it that the books are clearly ambivalent about the whole idea of Houses — Hermione mentions that it's divisive to have them, and Dumbledore at one point wonders if they do the sorting too early. It's cool.